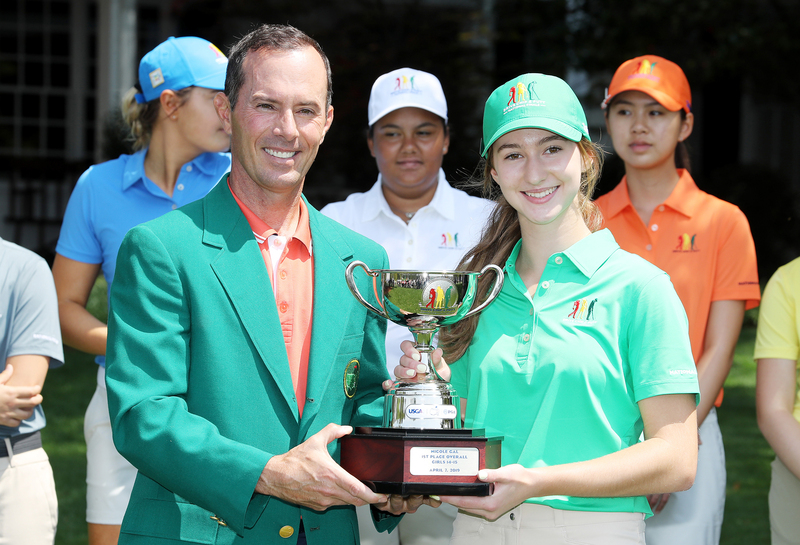 ADELAIDE, Australia – Ha Na Jang boldly predicted she’d finish at 10-under on Saturday evening; little did she realise it would be enough to lift the Patricia Bridges Bowl in the most dramatic circumstances. In a rollercoaster final round during which no fewer than five players held or shared the ISPS Handa Women’s Australian Open lead, Jang unleased a closing salvo that will long be remembered by all in a huge gallery at Royal Adelaide. The Korean hadn’t made a birdie in almost three hours on a day of trying, gusty winds as the overnight leaders imploded and left 17 people within three shots of the lead as birdies became a rare commodity. But in a truly incredible final hour from the 13th hole, the effervescent 24-year-old from Seoul went birdie-birdie-par-par-eagle-birdie to close out a remarkable back-nine 31 that simply left the field in her wake. Jang’s explosive finish left her a three-shot winner for her fourth career LPGA Tour title – all in the past 13 months. Maude-Aimée Leblanc finished at 5-under par (71-68-73-75) to close with a share a seventh place – a career best for the Sherbrooke, Que., product. 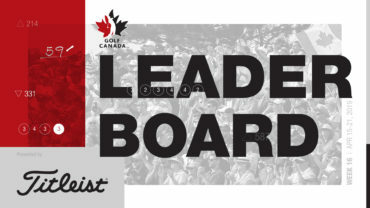 Fellow Canadian Alena Sharp also had a strong performance Down Under, finishing T16 at 3-under for the tournament. Brooke Henderson had an electric front nine with five birdies to shoot 32, but would play the back nine at 3-over par to finish at 2-under for the tournament in a tie for 21st. 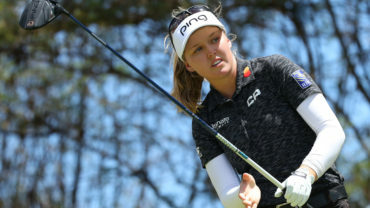 Unheralded Dane Nanna Madsen was one of few among the third-round leader to hold her ground and her even-par 73 was eventually good enough for seven under and second in a blanket finish for the minor placings. World No.2 Ariya Jutanugarn came from the clouds to momentarily lead, but a three-putt bogey on the 15th consigned her to a share of third at six under alongside defending champion Haru Nomura (73) and Australian pair Minjee Lee (70) and Sarah Jane Smith (75). Third-round leader Lizette Salas had recovered from an early lapse and led by three shots as she strolled the 11th fairway until four bogeys in five holes reduced her to a 78 and a share seventh. Her playing partner, Melbourne’s Su Oh, was also flattened by three back-nine bogeys and finished T14 after carding a 77. Hannah Green was the other Australian in the mix and briefly shared the clubhouse lead after her 71 left her at five under and her most impressive finish in her three-month professional career. But the day belonged to Jang, whose magnetic demeanour has won a horde of Australian fans in her third visit to the national championship, including five singing fans who supported loudly throughout her 69 strokes, most notably after her breathtaking eagle on the penultimate hole. “I’m just looking for the score board (early on the back nine) and it’s not really good scores for the other players,” Jang said. “I said, ‘OK, you can do it, just you try simple’. “Then on hole number 13 and 14 (I made) birdie. I’m starting more, like my mind is more exciting and I can do it more,” she bubbled. “I try like consultation and conversation, too, and then hole number 17, I try to think about the speed and it (was) very, very exciting. “(The putt is) feeling good, touching (my blade) solid, looks good, `Oh my God, that one is (to) make eagle — eagle, yeah! If that sounds excitable, it was probably only half as pumped as the crowd who’d taken her theatrics to heart, most notably the five chanting men. “I remember fan guy (as we were) starting hole No.1, saying, `Ha Na, let’s go. Ha Na Jang, you can do it”, like that. “So that’s why big fans every hole and every hole is a good shot (with shouts), `Good shot Ha Na, you can do it. Let’s go do it’, like that. Jang immediately promised to return to defend her title at Kooyonga next year. “I love Australia because food is good, people (are) really kind, I love the golf course and the weather is so good, because it’s not really hot. Strong windy and a little dry, I like dry arid conditions, so, really good,” she beamed before leaving with one final gem about her love of Aussie golf courses. “I like the golf course because (they’re) firm. I like fast green and firm green. Korea’s (courses are) really soft and (have) long grass, (with) little, soft green. 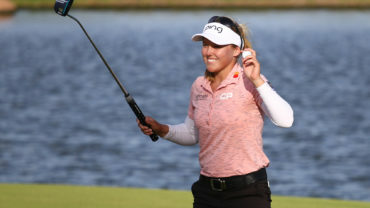 World No.1 Lydia Ko fired a closing 75 to finish two over, playing alongside world No.8 Brooke Henderson who threatened early in reaching five under, but fell away late to shoot 71 and finish two under, just outside the top 20.